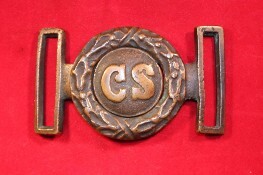 This is a Confederate two piece buckle known as the "Richmond Style". The tongue on this particular buckle has the exagerated serif lettering. This is a non excavated buckle with a nice smooth patina. This is certainly a rarer buckle that you do not come across every day. 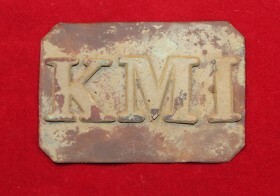 This is a brass buckle from the Kentucky Military Institute. It is in great shape having been dug decades ago on the old parade grounds of the school. It is quite unique in that each letter is individually fastened to the brass sheet. This buckle was purchased by me many years ago from Raphael Elledge of Shiloh Relics. I have only run across 2 or 3 of these in the last 30 years and this one is the nicest of those I have seen. These buckles were made by Isaacs and Campbell of London and brought to the south mostly by blockade runners. 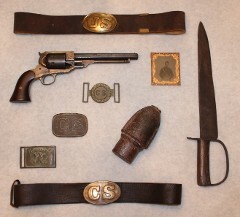 They commonly came with the belt rig associated with the Enfield rifle and were worn primarily by Confederate Soldiers. This is an excavated example but the recovery location is unknown. The belt adjuster was found with the buckle which is rare. All three pieces have a nice even brownish green patina. 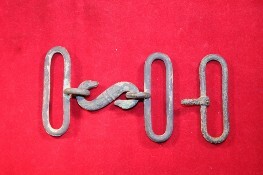 This is a nice excavated example of a "Georgia Frame" buckle. This buckle was dug in McMinnville, TN and has a slight bend in at as found. It is the standard style plate 152 in Mullinax's book. Perfect starter Confederate buckle for your collection. These style buckles were manfucatured in England and brought to the states mostly by blockade runners. They commonly came with the belt rig associated with the Enfield rifle. 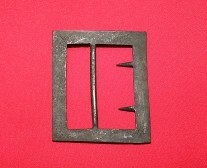 They were worn mostly by Confederates but some Union soldiers were outfuitted with this type of buckle as well. 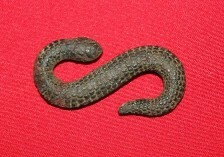 The is a very pretty example of a snake with a snake head. It would have attached to loops on either side. The recovery location of this relic is unknown.